This article provides a summary of the main decisions made by the Global Fund Board at its 38th meeting in Geneva, Switzerland on 14-15 November 2017. The Board’s Implementer Group called on donors to follow the example of Japan and contribute funding for the people of Venezuela through an existing funding mechanism – the Strategic Fund managed by the Pan American Health Organization. The group also called on the Global Fund to continue to explore concrete mechanisms to support efforts to address this unprecedented health crisis, and to develop a more proactive and effective approach to countries in crisis. The Strategy Committee has been reviewing the current Eligibility Policy with a view to proposing a revised policy to the Board in May 2018. The committee prepared a paper for the Board meeting just completed in which it provided its current thinking on key provisions of the policy. The committee favors keeping GNI per capita to measure income. And it believes that emergency funding for ineligible countries (such as Venezuela) should be addressed outside the policy. The Board has been wrestling for some time with how best to accommodate new public donors on a Board that, in terms of voting members, is delicately balanced between a donor bloc and an implementers bloc. As an interim measure, the Board has established a non-voting seat for new public donors. Efforts to find a longer-term solution will continue. The Secretariat’s semi-annual report on the implementation of the Global Fund Strategy 2017-2022 documents significant progress on many fronts. However, it also notes that timelines and resources have been squeezed in a year where record numbers of funding requests were reviewed and then massaged in grant-making. This article reports on progress made under the first of the four strategic objectives – “Maximize impact against the diseases.” We will report on progress in implementing activities under other strategic objectives in future issues. The $312.0 million operating expenses budget for 2018 approved by the Global Fund Board includes a one-time cost of $12.0 million for the planned move of the Fund’s offices to the Global Health Campus in Geneva in early 2018. The Board asked the Secretariat to do a comprehensive review of the 2019 operating expenses budget in an effort to identify savings to offset the one-time expense. The Technical Review Panel has prepared a report on the funding requests it reviewed in Windows 1 and 2 of the current allocation period. The TRP assessed 72 program continuation requests, 38 tailored requests and 35 full review requests. This article summarizes the TRP’s general observations. We need to work with the OIG more on agreed management actions to try to make the timelines and deliverables more realistic, Marijke Wijnroks says in the Annual Report of the Interim Executive Director 2017, prepared for the Board meeting just concluded in Geneva, Switzerland. This article summarizes what Wijnroks said about AMAs and about supply chain transformation; grant-making; “Fit for the Future”; Gavi and the Global Health Campus; and the transition to the new E.D., Peter Sands. The Global Fund went into the regional consultations on CCMs talking about a differentiated approach based on country size and operational context. They came out of the consultations describing the emergence of three CCM maturity levels – Basic Governance, Program Oversight and Strategic Engagement. The goal is still to have a CCM Evolution Plan ready for the Board’s 39th meeting in May 2018. Almost all of the targets for the 2017-2022 Key Performance Indicator Framework have now been approved, providing the Global Fund with a full set of targets against which to measure its work for the next few years. Striking the right balance between fiduciary and program risk is a major challenge for the Global Fund, the Office of the Inspector General says in its semi-annual progress report. Nevertheless, the OIG noted significant progress at both Secretariat and country levels. The OIG also provided information on its 2018 work plan and on the status of agreed management actions. In its report to the Board, the Technical Evaluation Reference Group provides updates on two key initiatives: the TERG’s Strategic Review 2017 and the launch of prospective country evaluations. Of particular interest: In future, the new TERG Documents Procedure, adopted by the Strategy Committee in October, will result in many TERG reports being made public. The Global Fund Board approved a 2018 operating expenses (OPEX) budget totaling $312.0 million. This is $12.0 million higher than the 2017 OPEX budget. The additional $12.0 million represents a one-time expense for the planned move of the Fund’s offices to the Global Health Campus in Geneva in 2018 (see separate article in this issue on the Report of the Executive Director). See the table below for a breakout of the 2018 OPEX budget by function. At the same time, the decision re-affirmed the Board’s commitment to keep total operating expenses for 2017-2019 within a $900 million ceiling, and asked the Secretariat to do a comprehensive review of the 2019 operating expenses budget. Translation: Find $12.0 million in savings in the 2019 budget. However, the Board asked the Secretariat to also do a comprehensive review of “the operating expenses required to meet the Global Fund’s strategic objectives.” This refers to a review that the Secretariat has already started, as part of the transition to the new executive director, Peter Sands, designed to present options to the E.D. for ensuring optimal alignment of human and financial resources to maximize impact against the objectives of the 2017-2022 Strategy. Translation: Maybe this comprehensive review will reveal where some savings can be achieved. The $12.0 million one-time cost presents the Global Fund with a significant headache. The $900 million for 2017-2019 works out to $300 million a year (on average). Final expenditures for 2017 are expected to come in at $300 million. That means that if the Fund is going to find $12.0 million in savings, they will have to come from either the 2018 or 2019 budgets. Additional efficiencies could only be achieved, the Secretariat said, by scaling back on priorities or critical enablers to the delivery of strategic objectives, cutting functions or level of service currently performed by the Secretariat or the Office of the Inspector General, or finding new sources of funding for activities currently under OPEX (e.g., funding for country coordination mechanisms, which would free up $9.5 million). The Secretariat also said that “the need for Board Committee recommendations and Board level approval, the lag time in the implementation of such decisions, and the related one-off transition costs will further delay the realization of savings beyond the considered one-year time horizon.” Translation: It’s too late now to identify and agree on $12.0 million in savings in the 2018 OPEX budget and expect to completely realize those savings in 2018. However, the Secretariat also said that trying to achieve $12.0 million in savings from the 2019 budget would present many of the same challenges. In addition, in 2019 there is a replenishment conference and a partnership forum planned. Nevertheless, finding the savings in the 2019 budget appears to be what the Board is asking the Secretariat to do. Caveat: Given that the over-riding consideration is to keep 2017-2019 expenditures within the $900 million ceiling, it should be okay if the Secretariat finds some of the necessary savings in 2018 and some in 2019. Note that although the move to the Global Health Campus involves considerable outlays initially, the Secretariat says that the move will generate savings such that it will pay for itself within five years. 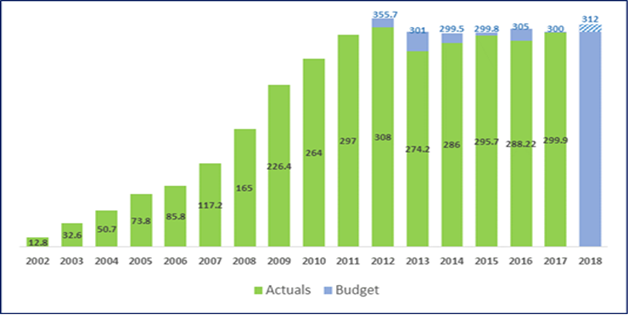 Until 2012, when it peaked at $355.7 million, the operating budget had risen steadily each year. However, since 2013, it has been almost flat, around $300.0 million a year (see chart). At $135.5 million, the costs of the Grant Management Division represent 44% of the 2018 OPEX budget. The budget includes $15.9 million for the Office of the Inspector General, and $5.6 million for the Office of Board Affairs. At $9.5 million, the budget for country coordinating mechanism costs is down 10% from estimated expenditures for 2017. And, at $48.3 million, the budget for local fund agent costs is down 5% from estimated 2017 expenditures. The Board also approved the 2018 Corporate Work Plan and Budget Narrative. Board Documents GF-B38-04A Operating Expense Budget 2018 and GF-B38-04B Corporate Work Plan 2018 should be available shortly at at www.theglobalfund.org/en/board/meetings/38.